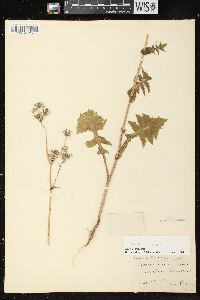 Annuals or biennials, 10-140(-200) cm. Stem bases soft to hard, herbaceous, often hollow. Leaves: blades of mid cauline spatulate or oblong to obovate or lanceolate, 6-35 × 1-15 cm, bases auriculate, auricles deltate to lanceolate, ± straight, acute, margins usually pinnately (often runcinately) lobed, lobes ± deltate to lanceolate, not constricted at bases, terminals usually larger than laterals, entire or dentate. Peduncles usually glabrous, sometimes stipi-tate-glandular. Involucres 9-13+ mm. Phyllaries usually glabrous, sometimes tomentose and/or stipitate-glandular. Corollas: ligules ± equaling tubes. Cypselae dark brown, mostly oblanceoloid, 2.5-3.5+ mm, ribs 2-4 on each face, faces transversely rugulose or tuberculate across and between ribs; pappi 5-8 mm. 2n = 32, 36. Flowering (Apr-)Jul-Oct (year-round in south). 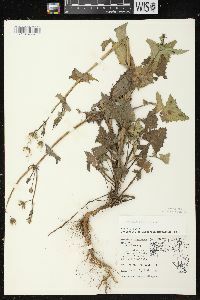 Disturbed sites, gardens, roadsides, along streams; 0-2000 m; introduced; Greenland; St. Pierre and Miquelon; Alta., B.C., Man., N.B., Nfld. and Labr. (Nfld. ), N.W.T., N.S., Ont., P.E.I., Que., Sask. ; Ala., Alaska, Ariz., Ark., Calif., Colo., Conn., Del., D.C., Fla., Ga., Idaho, Ill., Ind., Iowa, Kansas, Ky., La., Maine, Md., Mass., Mich., Minn., Miss., Mo., Mont., Nebr., Nev., N.H., N.J., N.Mex., N.Y., N.Dak., Ohio, Okla., Oreg., Pa., R.I., S.C., S.Dak., Tenn., Tex., Utah, Vt., Va., Wash., W.Va., Wis., Wyo. ; Europe; introduced also in Mexico, West Indies, Bahamas, Central America, South America, Africa, Asia, Pacific Islands (New Zealand), Australia. There are reports of this species being found throughout the state. 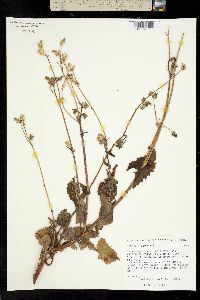 In my early botanical work I did not collect what I considered common garden weeds, and in most instances this accounts for the comparative paucity of specimens of these common plants. 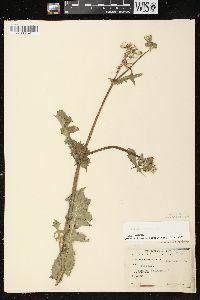 This species is a weed and prefers rich soil. It is found mostly in gardens, truck gardens, waste places, and fallow fields and along railroads and roadsides. 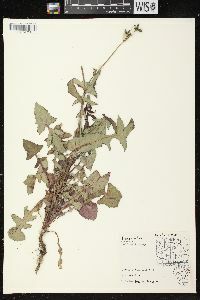 Annual 1-20 dm from a short taproot, glabrous except sometimes for a few spreading gland-tipped hairs on the invols and peduncles; lvs pinnatifid to occasionally merely toothed, soft, the margins only weakly or scarcely prickly, 6-30 נ1-15 cm, all but the lowermost ones prominently auriculate, the auricles well rounded but eventually sharply acute; lvs progressively less divided upward and ±reduced; heads several in a corymbiform infl, relatively small, 1.5-2.5 cm wide in fl; invol 9-13 mm in fr; fls 80-250 per head; cor-tube about equaling the ligule; achenes 2.5-3.5 mm, transversely rugulose and evidently to rather obscurely 3-5-ribbed on each face; 2n=32, 36. A cosmopolitan weed, native to Europe. July-Oct.